Cross-Site Scripting (XSS) is an attack in which malicious scripts can be injected on a page. 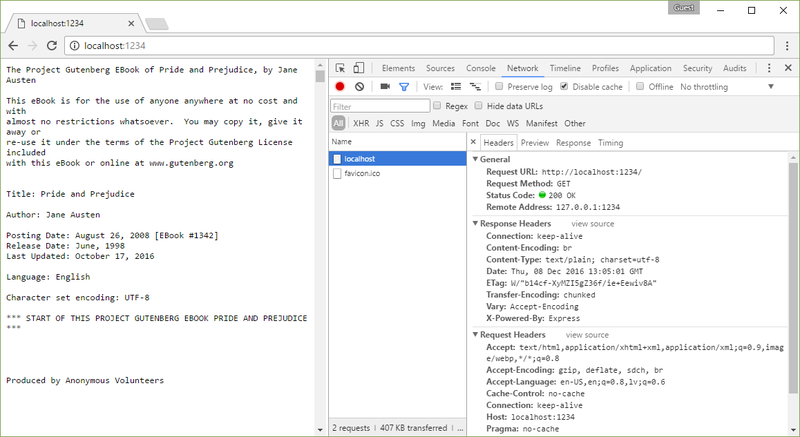 This is a pretty obvious attack and something that browsers can block: if you find a part of the request in the source code, it might be an attack. The X-XSS-Protection controls this behavior. 1 Filter enabled. If a cross-site scripting attack is detected, in order to stop the attack, the browser will sanitize the page. 1; mode=block Filter enabled. 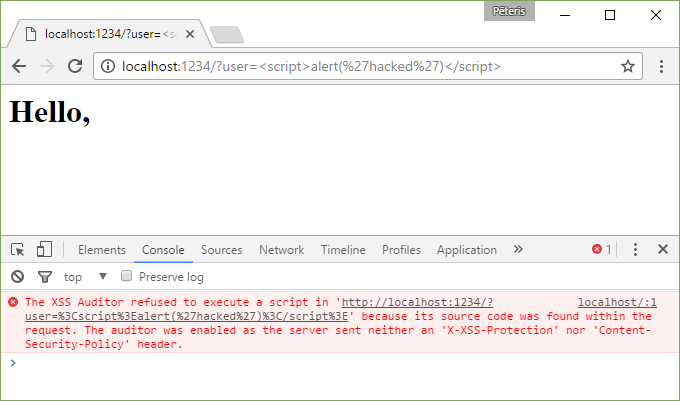 Rather than sanitize the page, when a XSS attack is detected, the browser will prevent rendering of the page. 1; report=http://domain/url Filter enabled. The browser will sanitize the page and report the violation. This is a Chromium function utilizing CSP violation reports to send details to a URI of your choice. Let's create a simple web server with node.js to play with this. I am using Google Chrome 55. Nothing happens. The browser successfully prevented this attack. 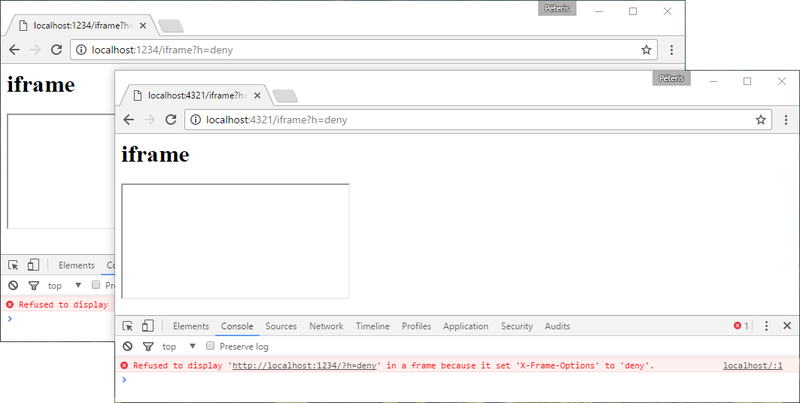 This is the default behavior in Chrome if no header is set, as you can see in the error message in the Console. It even helpfully highlights it in the source. The attack was successfully blocked by sanitizing the page because of our explicit header. The attack is blocked by simply not rendering the page. The attack is blocked and also reported to an address of our choice. This header allows you to prevent clickjack attacks. Imagine that an attacker has a YouTube channel and he needs subscribers. He can create a website with a button that says "Do not click" which means that everyone will definitely click on it. But there's a completely transparent iframe on top of the button. When you click the button, you actually click on the Subscribe button on YouTube. If you were logged into YouTube, you will now be subscribed to the attacker. First, install the Ignore X-Frame headers extension. As you can see, I have cleverly positioned the viewport of the iframe to the Subscribe button. The iframe is on top of the button (z-index: 1) so when you try to click the button you click on the iframe instead. In this example, the iframe is not completely hidden but I could do that with opacity: 0. In practice, this does not work because you are not logged into YouTube, but you get the idea. 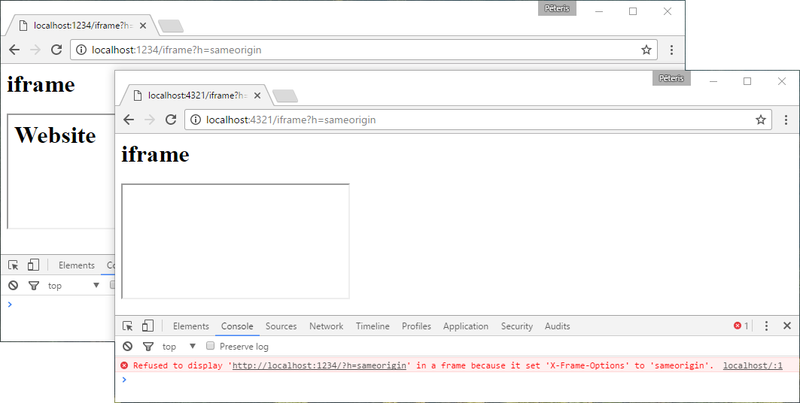 You can prevent your website from being embedded as an iframe with the X-Frame-Options header. deny No rendering within a frame. sameorigin No rendering if origin mismatch. allow-from: DOMAIN Allows rendering if framed by frame loaded from DOMAIN. We are going to use this webserver for experiments. Everyone can embed our website at localhost:1234 in an iframe. 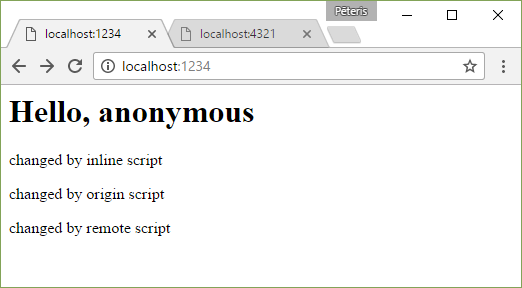 No one can embed our website at localhost:1234 in an iframe. Only we can embed our website at localhost:1234 in an iframe on our website. An origin is defined as a combination of URI scheme, hostname, and port number. 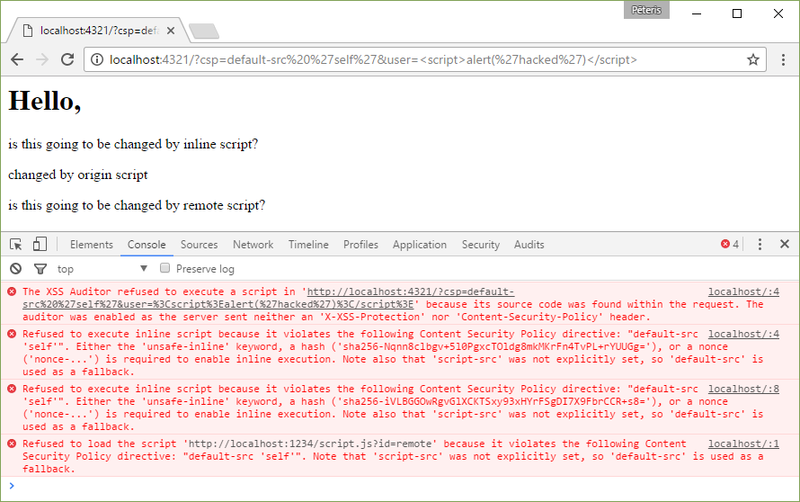 It looks like Google Chrome ignores this directive because you can use Content Security Policy (see below). 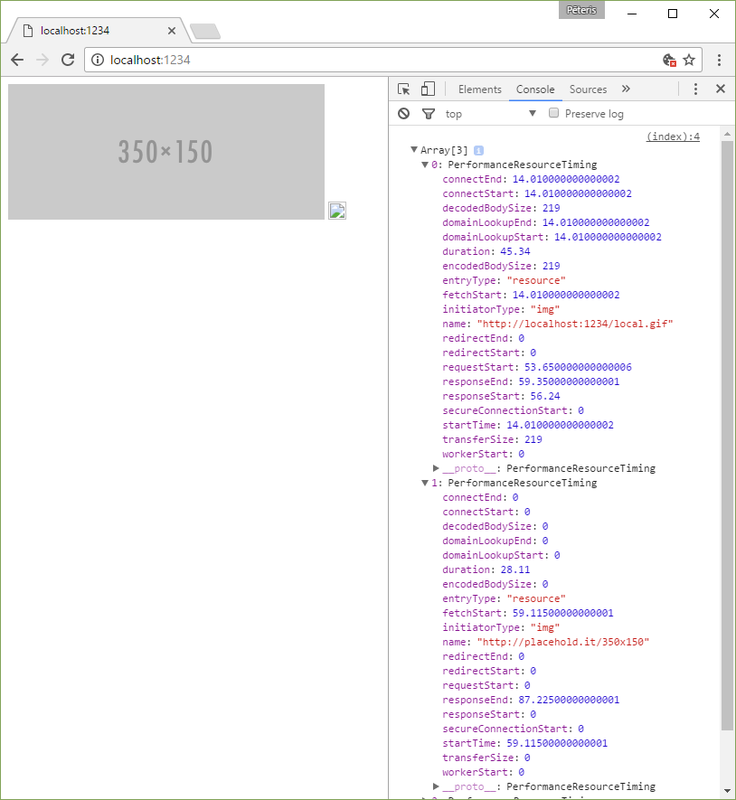 Invalid 'X-Frame-Options' header encountered when loading 'http://localhost:1234/?h=allow-from%20http://localhost:4321': 'allow-from http://localhost:4321' is not a recognized directive. The header will be ignored. It also had no effect in Microsoft Edge. This header prevents MIME confusion attacks (<script src="script.txt">) and unauthorized hotlinking (<script src="https://raw.githubusercontent.com/user/repo/branch/file.js">). This time the content types do not match and the file was not executed. 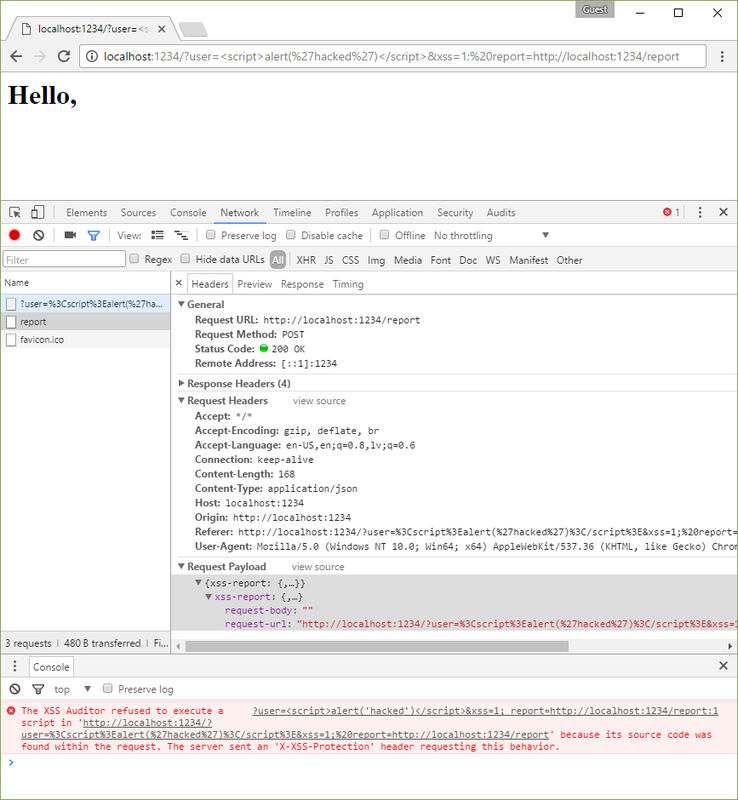 The new Content-Security-Policy (CSP) HTTP response header helps you reduce XSS risks on modern browsers by declaring what dynamic resources are allowed to load via a HTTP Header. It works like you would normally expect it to. default-src applies to all resources (images, scripts, frames, etc.) and the value of 'none' doesn't allow anything. We can see it in action here, along with very helpful error messages. 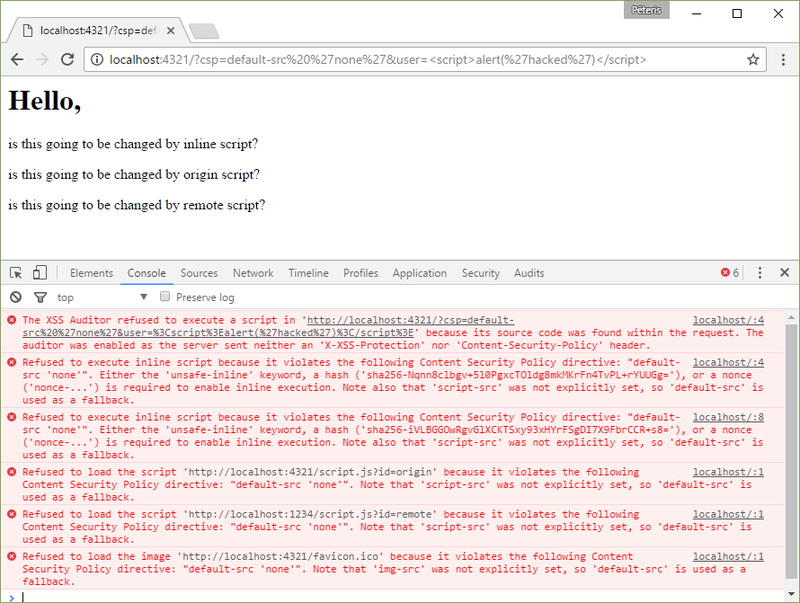 Chrome refused to load or execute any of the scripts. It also tried to load favicon.ico even though it's also prohibited. Now we can load scripts from our origin, but still no remote or inline scripts. This time we also allow inline scripts to run. Note that our XSS attack was also prevented. But not when you allow unsafe-inline and set X-XSS-Protection: 0 at the same time. content-security-policy.com has nicely formatted examples. 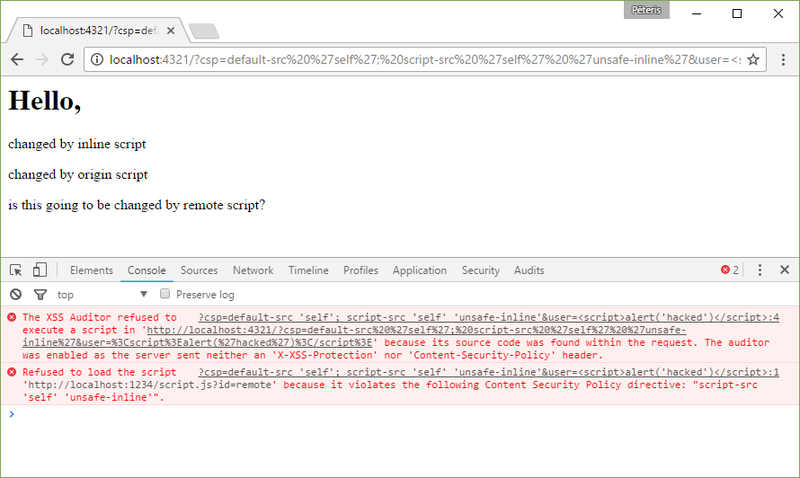 default-src 'none'; script-src 'self'; connect-src 'self'; img-src 'self'; style-src 'self'; allows images, scripts, AJAX, and CSS from the same origin, and does not allow any other resources to load (eg object, frame, media, etc). It is a good starting point for many sites. If you take a look at facebook.com and twitter.com headers, they use CSP a lot. HTTP Strict Transport Security (HSTS) is a web security policy mechanism which helps to protect websites against protocol downgrade attacks. Let's say that you want to go to facebook.com. Unless you type https://, the default protocol is HTTP and the default port for HTTP is 80. So the request will be made to http://facebook.com. And then you are redirected to the secure version of Facebook. If you were connected to a public WiFi that an attacker is running, they could hijack this request and serve their own webpage that looks identical to facebook.com and collect your password. What you can do to prevent this is to use this header to tell that the next time the user wants to go to facebook.com, they should be taken to the https version instead. If you logged into Facebook at home and then went to facebook.com on the insecure WiFi, you'd be safe because the browser remembers this header. But what if you used Facebook on the insecure network for the first time ever? Then you are not protected. 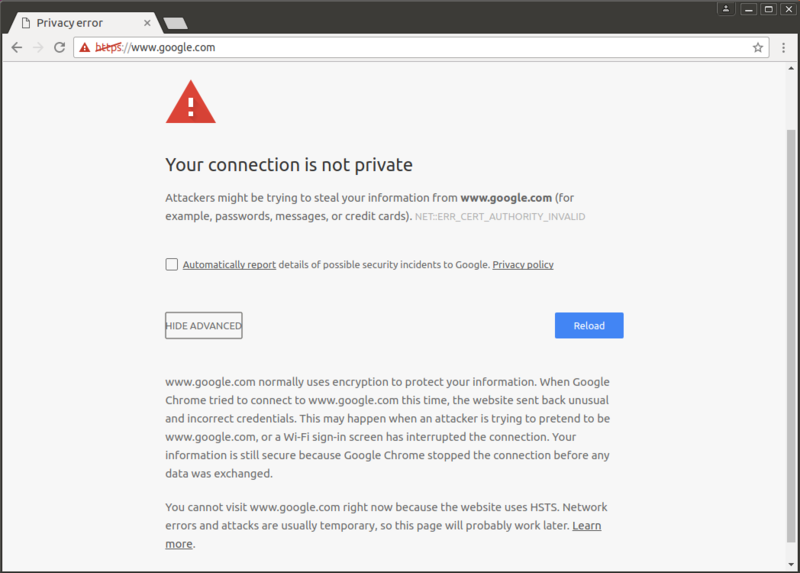 To fix this, browsers ship with a hard-coded list of domains known as the HSTS preload list that includes the most popular domain names that are HTTPS only. If you want to, you could try to submit your own here. It's also a handy website for testing if your site is using this header correctly. Yeah, I know, mine doesn't. max-age=15552000 The time, in seconds, that the browser should remember that this site is only to be accessed using HTTPS. includeSubDomains If this optional parameter is specified, this rule applies to all of the site's subdomains as well. 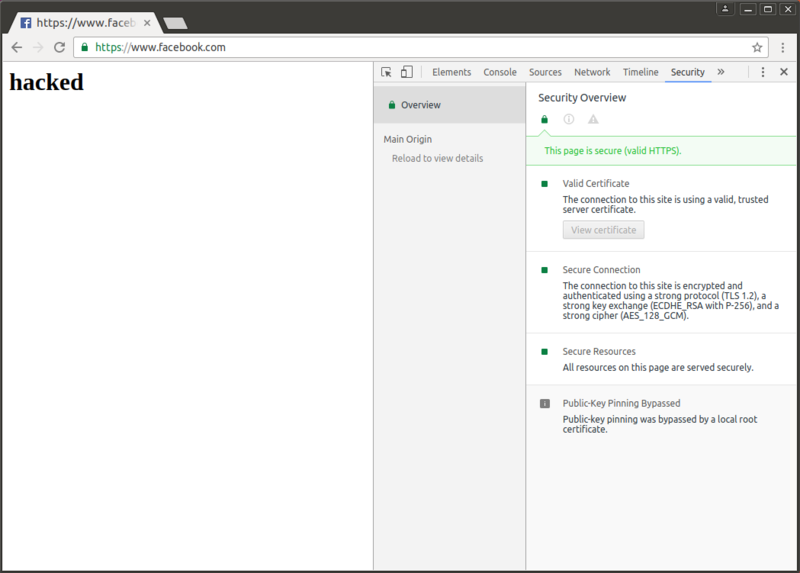 preload If the site owner would like their domain to be included in the HSTS preload list maintained by Chrome (and used by Firefox and Safari). What if you need to switch back to HTTP before max-age or if you had preload? You are out of luck. This header is very strictly enforced. You'd need to ask all of your users to clear their browsing history and settings. HTTP Public Key Pinning (HPKP) is a security mechanism which allows HTTPS websites to resist impersonation by attackers using mis-issued or otherwise fraudulent certificates. pin-sha256="<sha256>" The quoted string is the Base64 encoded Subject Public Key Information (SPKI) fingerprint. It is possible to specify multiple pins for different public keys. Some browsers might allow other hashing algorithms than SHA-256 in the future. max-age=<seconds> The time, in seconds, that the browser should remember that this site is only to be accessed using one of the pinned keys. report-uri="<URL>" If this optional parameter is specified, pin validation failures are reported to the given URL. Why do we need this? Isn't trusting Certificate Authorities enough? An attacker could create their own certificate for www.facebook.com and trick me into adding it to my trust root certificate store. Or it could be an administrator in your organization. Let's create a certificate for www.facebook.com. And make it trusted on our computer. 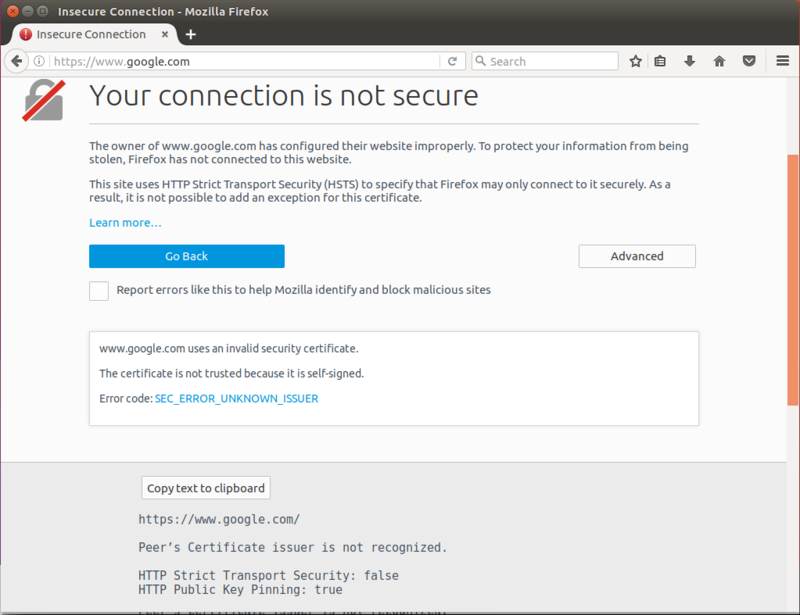 Let's create our own web server that uses this certificate. Because I've visited Facebook before and Google Chrome has seen the header, it should report the attack but still allow it, right? Nope. Public-key pinning was bypassed by a local root certificate. Interesting. Same. I guess this is a feature. Anyway, if you don't add these certificates to your store, you won't be able to visit these sites because the option to add an exception in Firefox or Proceed unsafely in Chrome are not available. The content is compressed with Brotli. It promises better compression density and comparable decompression speed to gzip. It is supported by Google Chrome. Naturally, there is a node.js module for it. The Resource Timing API allows you to measure how long it takes to fetch resources on your page. Because timing information can be used to determine whether or not a user has previously visited a URL (based on whether the content or DNS resolution are cached), the standard deemed it a privacy risk to expose timing information to arbitrary hosts. It looks like you can get detailed timing information (domain lookup time, for example) only for resources that are on your origin unless the Timing-Allow-Origin is set. Alternative Services allow an origin's resources to be authoritatively available at a separate network location, possibly accessed with a different protocol configuration. It means that the browser can use, if it wants to, the QUIC (Quick UDP Internet Connections) or HTTP over UDP protocol on port 443 for the next 30 days (max age is 2592000 seconds or 720 hours or 30 days). No idea what v stands for. Version? Some browsers require third party cookies to use the P3P protocol to state their privacy practices. 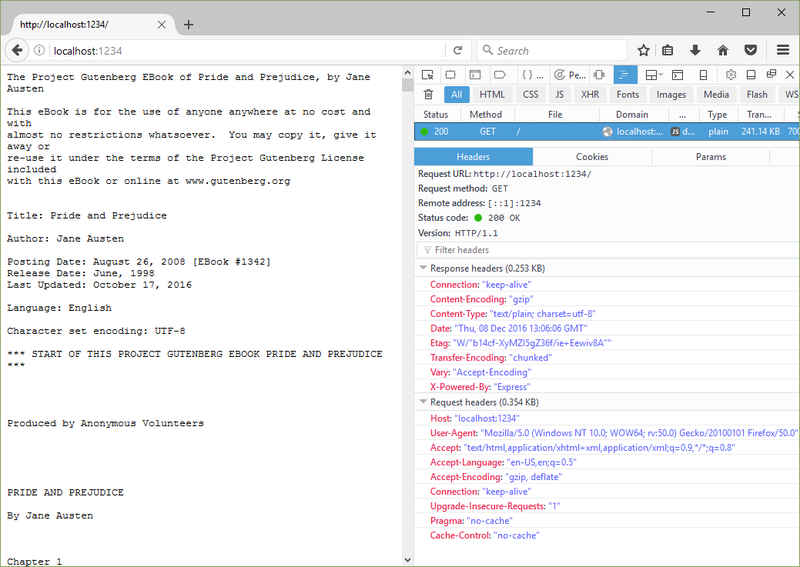 The organization that established P3P, the World Wide Web Consortium, suspended its work on this standard several years ago because most modern web browsers don't fully support P3P. As a result, the P3P standard is now out of date and doesn't reflect technologies that are currently in use on the web, so most websites currently don't have P3P policies. I did not do much research on this but it looks like this is needed for IE8 to accept 3rd party cookies.